This started out as a ballpoint sketch, which I then brought into photoshop and worked right into (sort of gave it that Brian Taylor look). 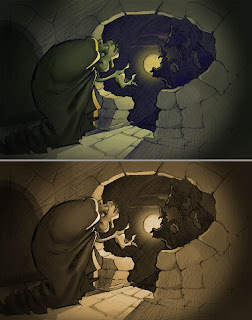 I honestly can't decide which version I like better...colour, or monochromatic. Any ideas? Part of the reason for my lack of posts recently is that my painting world has been rocked by Morgan Weistling. I picked up his (excellent) 10-hour oil demo last month, and its made me look at a lot of my own procedures and re-evaluating them. He paints with little tiles of colour, and the effect that gives is something I'm interested in finding in my own work. It's new to me, and it's a little scary. 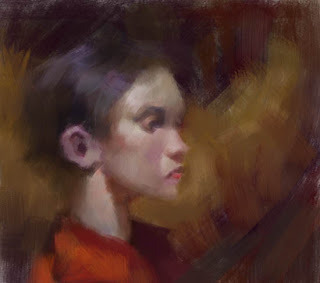 So here's a Weistling study. 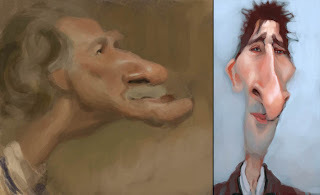 Speed caricature painting of one of Sargent's portraits of Coventry Patmore. These paintings are good to wind down with at the end of the day. Well, here's a rarity...something finished! 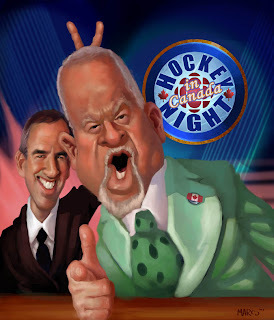 This is a gift for CBC's Hockey Night In Canada. I've practically grown up watching this program. 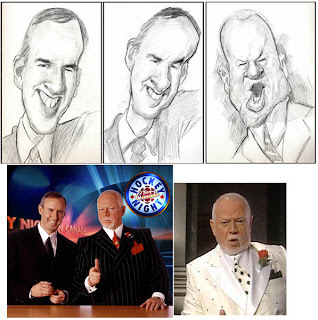 If you are Canadian, and you like Hockey, you know about the dynamics between these two guys. Anyway, the first image is the final, and the second image is examples of some of the photo reference I used, as well as a few preliminary sketches I did for likeness. This is probably the highest degree of 'finish' I've ever put into a painting. It was weird, actually zooming in to 100% and noodling little things out. It's not quite what I'm comfortable with. It looks as though this might actually receive some airtime on the show! Here's hoping. 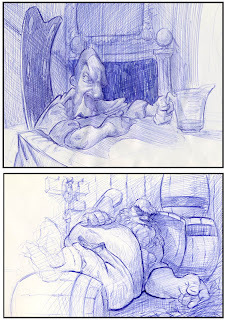 A couple more ballpoint sketches. I seem to be falling into the "one update per week" thing. That may ride out a little longer, as work is starting to crunch down. I'll do what I can!